Healthy Behavior is the cornerstone for both controlling costs and improving the health and fitness of your workforce. Our products address both routine healthy behaviors applicable to all of your healthplan members, and the special needs of your high users of healthcare services. Provider Efficiency varies widely and costs you and your members money unnecessarily and delivers no incremental value. Our products bring this situation under control while assuring convenient access to providers. 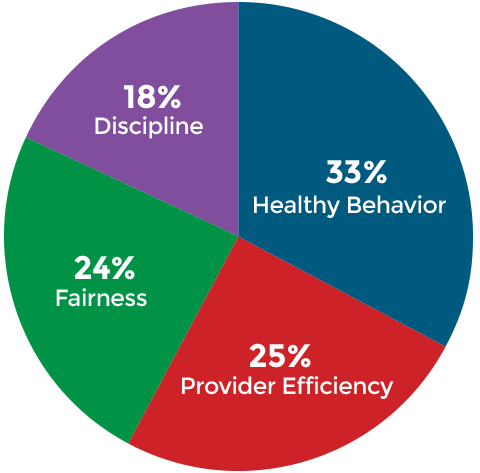 Fairness is important in a well-designed healthplan. Most conventional plan designs fall short. Burd Health’s approach increases fairness and helps make sure that your company and your members pay no more than they should to cover their healthcare needs. Discipline is critical to achieving great results. Most healthcare plans are only partially successful in achieving it. Burd Health’s products bring increased discipline for providers, adjudicators, and plan administration. 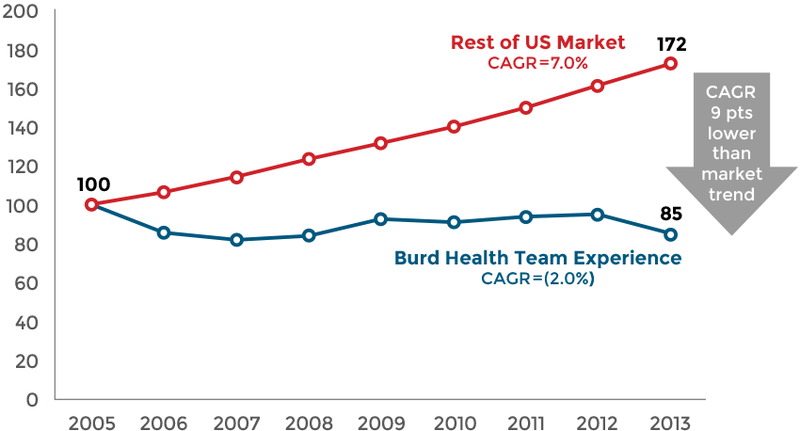 In all likelihood, you have never seen our Burd Health products before, as most of them are currently used by less than 1% of commercial healthplans. And, if you have seen something similar to a few of them, the Burd Health application renders these solutions thoroughly innovative and high value. We apply proprietary algorithms to your data to quantify real healthcare cost savings for your organization. We are a solutions company that works directly with your management team to achieve these savings. Burd Health manages the process from start to finish working collaboratively with HR, and provides extensive implementation support throughout the process. We provide tools, supporting resources, tailored communications, and tracking dashboards to implement the products and services you select in a way that is right for your employees, and does not burden the HR team. We accept operating risk by charging fees only when you save money – with our shared-savings revenue model, our compensation is 100% performance based and we do not bill for any travel or expenses. We win only when you win. Starting with your data, we quantify the real opportunity for your organization. We request information that is commonly available within the HR organization and your TPA, and apply proprietary algorithms, grounded in our team’s deep experience, to quantify the healthcare cost savings we believe your organization can achieve through our products and services. 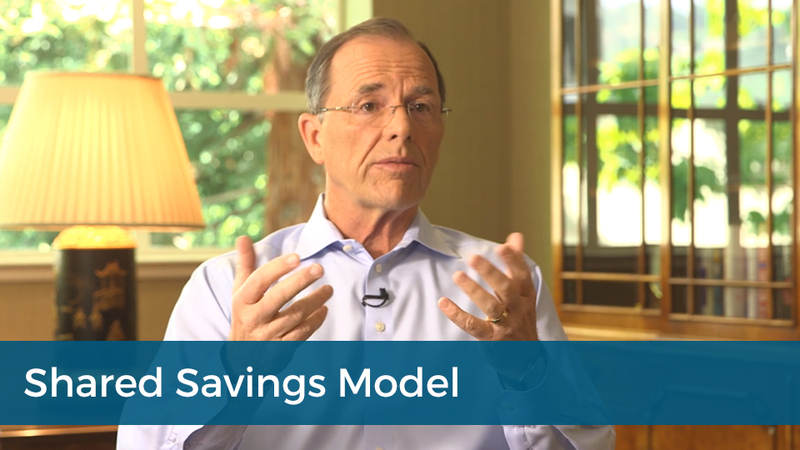 Together, we review the savings opportunities to determine the products and services that are right for your organization. We discuss the healthcare cost and population health objectives you want to achieve, as well as the unique cultural considerations that inform the way you want to approach these changes. This shapes the scope of our engagement – which could range from a couple of discrete initiatives to a transformational effort to create a culture of health and fitness within the organization. We then jointly determine the sequencing and timing of implementation. The services agreement formalizes our relationship – it confirms the scope of services Burd Health will provide. It details how the savings will be calculated and tracked for each of the selected products and services under our shared-savings model, and specifies how Burd Health will be compensated. Unlike many shared-savings models, our approach is practical, fact-based, and transparent – Burd Health bills quarterly in arrears only after you have achieved real reductions in your healthcare costs. We engage key stakeholders in your organization and begin implementation. We manage the overall implementation process partnering with HR, and provide all applicable tools (customized as needed), supporting resources, and tailored employee communication materials. As the products and services are launched, we provide monthly progress reports demonstrating adoption and corresponding improvements in relevant healthcare cost and population health metrics. Typically, our clients see improvements in the very first quarter after implementation.